Which Electric Griddle Should You Get? Electric griddles are great kitchen tools that can save you a lot of time whenever you are preparing large meals. 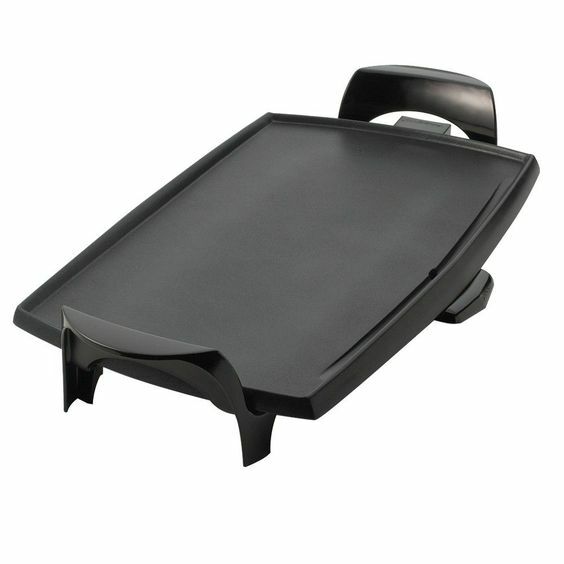 It is ideal for breakfasts foods that can be quickly cooked using a griddle. 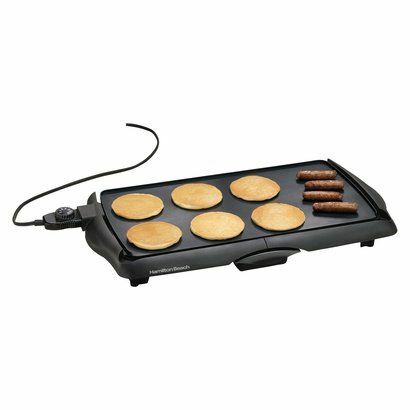 Foods including pancakes, eggs, s﻿﻿ausages, ham, bacon, and even toast can be cooked at the same time using one large electric griddle. If you have a large family, or if you are plainly a heavy breakfast eater, getting yourself a nice electric griddle will not only save you time and effort when it comes to preparing several types of food but will also save you from doing several cleanups. Simply put, if you use one griddle to cook your meals, you would not have to clean several skillets after cooking. Another great thing about electric griddles that can make you consider getting one for your kitchen is the fact that it heats up very quickly, therefore enabling you to cook multiple types of food in mere minutes. Some electric griddles today even come with dividers that will help you keep different types of food from mixing together. Electric griddles usually come with a flat surface that’s approximately 15 or more inches long. Today, you will be able to find larger electric griddles with sizes from 15 up to 25 inches. The size of the electric griddle you should purchase would first depend on your counter space. The second thing you should consider before you purchase a sizeable electric griddle is how much food you actually plan to cook in it. If you don’t plan to prepare much food with your electric griddle, you may do fine with a 15-inch one. Lastly, make sure you are choosing an electric griddle that can fit in your kitchen cupboard or cabinet. After all, you would not want to have extra kitchen tools lying around your counter when they aren’t being used. Try to choose an electric griddle that comes with a non-stick coating or a ceramic surface. This feature makes clean-up of your griddle faster and easier. From perfectly cooked sunny side up eggs to smooth and fluffy pancakes, having a non-﻿stick ﻿surface will help you remove any type of food from your griddle with complete ease. However, you must not forget that most non-stick coated surfaces are highly sensitive and are prone to scratches. To avoid ruining your electric griddle’s non-stick coating, avoid using metal ﻿﻿﻿utensils such as spatulas, spoons, and forks when cooking with your griddle. Though most electric griddles come with a smooth surface because it is ideal for breakfast foods such as eggs and pancakes, you can find some griddles in today’s market that comes with grill inserts. If you plan to cook more types of food such as steaks, pork chops, or other types of food that would look great with hot grill marks, you ought to get an electric griddle with grill insert options. Don’t forget to look out for heat controls that you will be comfortable to use. Try to go with an electric griddle that has a simple dial or button for setting the heat. Also check for standard heat settings such as low, medium, and high heat. Another thing you may want to look out for when buying an electric griddle is a dual thermostat that will let you set different temperatures for different areas of your griddle’s cooking surface. What’s great about electric griddles with dual thermostats is that you can cook foods that require different cooking times simultaneously. For example, you can cook a sunny side up egg on one side of your griddle while you cook sausages on the other. If you don’t want to have a messy counter, you might as well get an electric griddle that is equipped with a handy drip tray. Depending on what type of food you are cooking, you might get plenty of grease build-up on your griddle’s cooking surface. Once your griddle’s surface is full of grease, the grease will either fall on your countertop or continue to pile up on your cooking surface. Having a drip tray on your electric griddle will prevent any of these from happening. Try to look for a griddle that’s easy to clean and maintain. 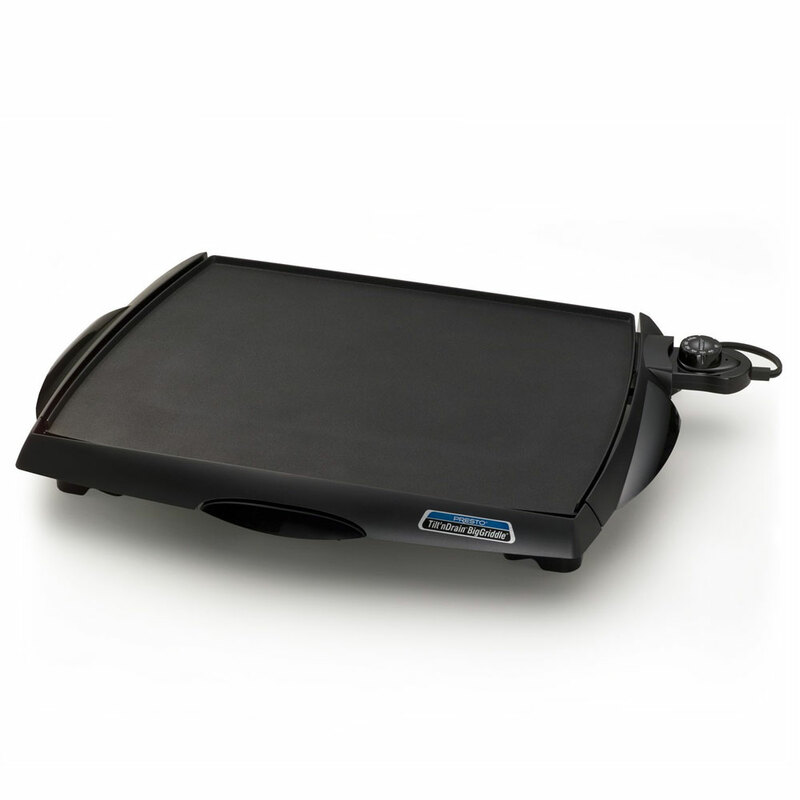 An electric griddle with removable parts that are dishwasher-safe is the ideal choice here. Some electric griddles can even be fully submerged in water for hassle-free cleaning and maintenance. This electric griddle has a 22-inch cooking surface that will allow you to cook two or three rounds of breakfast food with ease. It is made with heavy-duty aluminum that is not only designed to have great heat conduction but will last you many years as well. It even comes with a non-stick coating so that you wouldn’t need to use cooking oils. Another great feature of this product is that it comes with removable handles that will let you place it inside 18-inch cupboards. It also comes with a handy slide-out drip tray that effectively captures the grease from the cooking surface. Lastly, this product is very easy to clean and maintain because of its build that can be fully submerged in water. 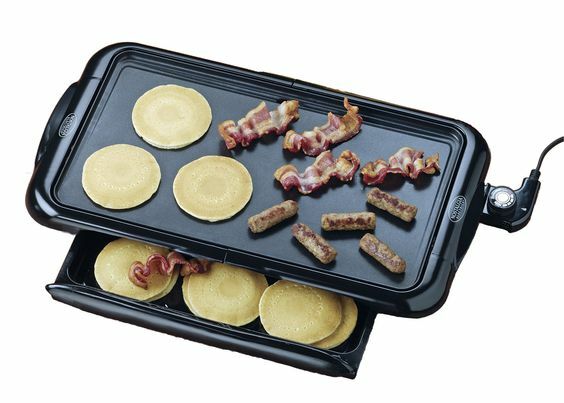 If you want an electric griddle that is ideal for cooking greasy foods such as bacon, the Presto Tilt 'n Drain Big Electric Griddle can be the best choice for you. This electric griddle is also made with non-stick coated heavy-duty aluminum that is guaranteed to last for years. This electric griddle is ideal for cooking greasy foods because of its tilt feature that will let the grease effortlessly fall into the drip tray. What’s more is that this griddle comes with a master heat setting that can help you maintain cooking temperatures while you cook. Lastly, this product also comes with removable handles for easy storage and a build that can be completely submerged in water. 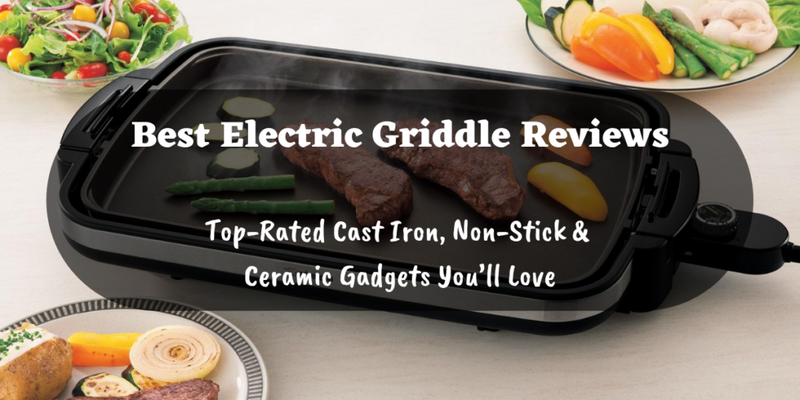 Yes, this electric griddle is more expensive than the others included in this list, but you will not be regretting spending some extra cash on this product because you will surely get what you pay for. 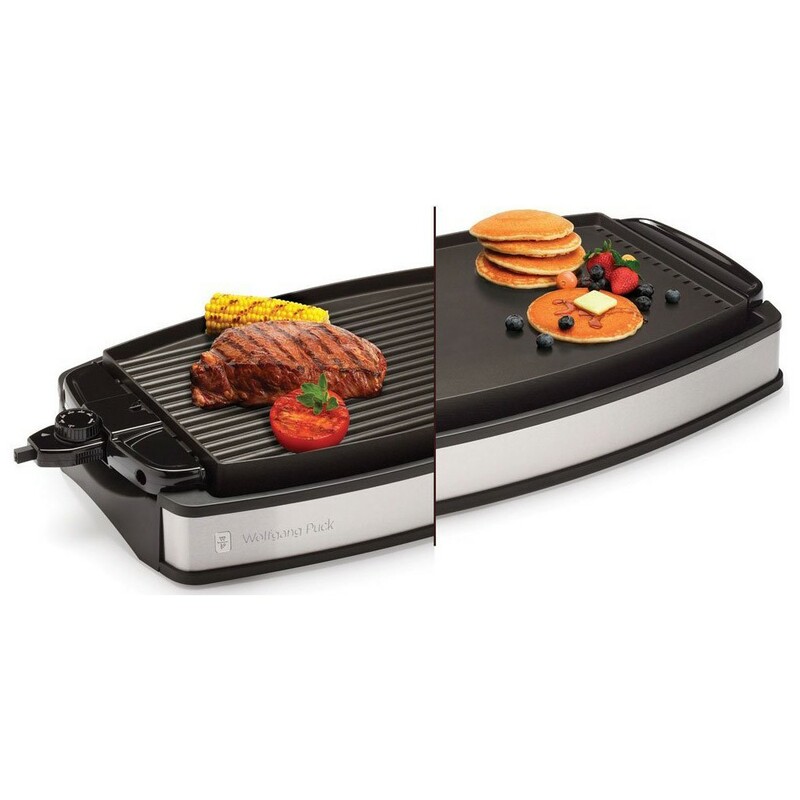 As its name suggests, the Wolfgang Puck Electric Grill and Griddle provides you with a flat cooking surface that is ideal for pancakes and eggs, and a grilling side ideal for steaks. Aside from being a total two-in-one product, this electric griddle is also fairly easy to maintain and clean. 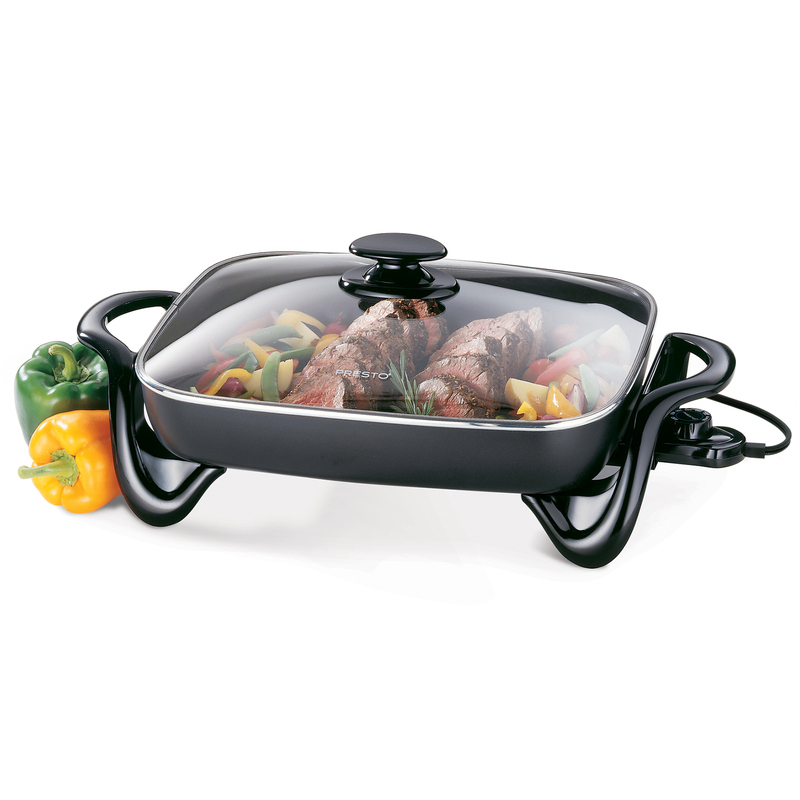 It comes with a non-stick coated cooking surface that can easily be wiped clean with a moist cloth. Another interesting feature of this product is its heat-resistant handles that reduces the risk of your hands being burned. If you are on a budget but would still like to get one of the best electric griddles you can find online, look no more because the Presto 06852 Skillet might be the electric griddle for you. Though this electric griddle is cheaper than competing products, it still performs at par with its competition. What I like best about this electric griddle is that it comes with a glass lid that you can use to prevent grease from splattering onto your skin or shirt. What’s more is that its glass lid will allow you to use this as a serving dish. And just like the other electric griddles included in this list, this one is also very easy to clean and maintain. It comes with removable parts that you can clean in the dishwasher, and you can fully submerge its body underwater for thorough cleaning. If you are looking for an electric griddle with a considerable cooking surface, this is an ideal choice. It is ideal for big and busy families who might need to cook a lot of food for breakfast. Unlike other electric griddles, it comes with a lid that keeps steam in and can also be used to prevent oily foods from splattering – great for those who hate oils splattering on them. It also has the best heating capability as the surface has even temperature. Even heating capacity. You can cook on all surface levels because there are no cold spots. It is heavier than other griddles. All these product recommendations are great but at the end of the day, you would want to get one that is the perfect choice for you. We recommend getting the Zojirushi EA-DCC10 Gourmet Sizzler Electric Griddle for those who are serious about cooking and who often cook for a big family. It is the most reliable when it comes to heat distribution, so you can maximize its cooking surface. The Presto 06852 Skillet is an inexpensive option. It comes with a lid, so you can use it as a server when throwing parties. 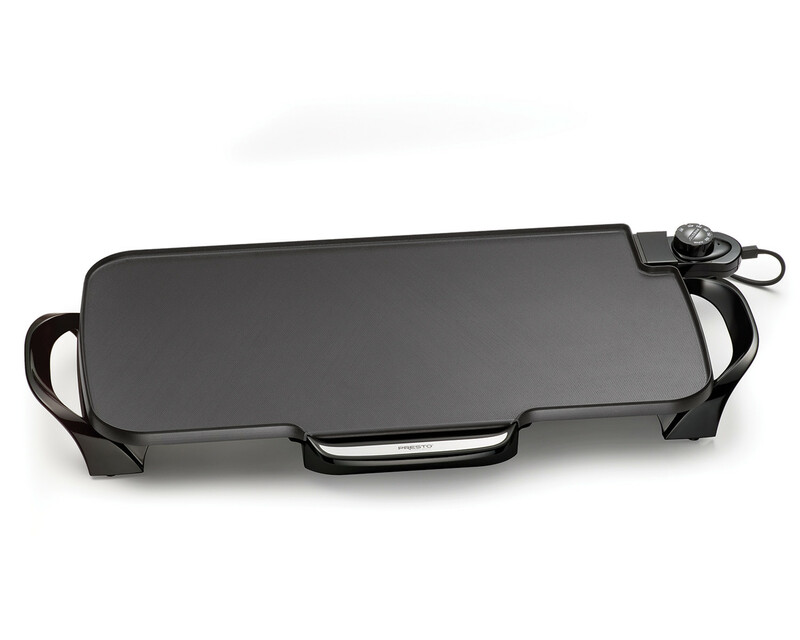 The simplicity of the Presto Electric Griddle makes this a great starter griddle for small families. It is also ideal for those who are on a budget and who likes a griddle that isn’t difficult to clean. If you are cooking burgers and need even heating, buy the best electric griddle: the Presto Electric Griddle. This beats the competition, thanks to its good quality and removable handles. Get the Presto Tilt ‘n Drain Big Electric Griddle if you want something bigger. You can cook more food on its surface. We recommend the Wolfgang Puck Electric Grill and Griddle for those who want to have a griddle that can cook more food. It’s a bit more expensive than others but should last you for a long time. Make sure you click the links of the griddle you think is the best option for you. Head to our homepage for more kitchen equipment product reviews, recommendations and buying tips.